As December wound quietly to a close the weather turned warm and golden during the week between Christmas and the New Year. I wore this for work on one of my half days, even though the office was more casual than usual, I opted for something a little more dressed up. I can't help myself, especially around the holidays. I recently bought this white button down from H&M and have worn it constantly since then. It is the perfect staple blouse, made of sheer, crisp white cotton and plenty of length to tuck it in but not bulky at the shoulders. The slight overlap of the collar is my favorite feature, I'm not even sure that is supposed to happen, but I love that it resembles origami at my throat. Paired with basic black felt a little too much like a uniform, but with red-brown oxfords and an autumnal green cardigan with gold button detail it was just right for the transition from the office to afternoon shopping in SoHo. The shoes and the bag are amazing! I love this oufit! The cardigan is great and the shoes and purse are so amazing. Your cardigan is fantastic! As is that purse. That bag with those shoes is kind of amazing. i love the shot of the bag and shoes! 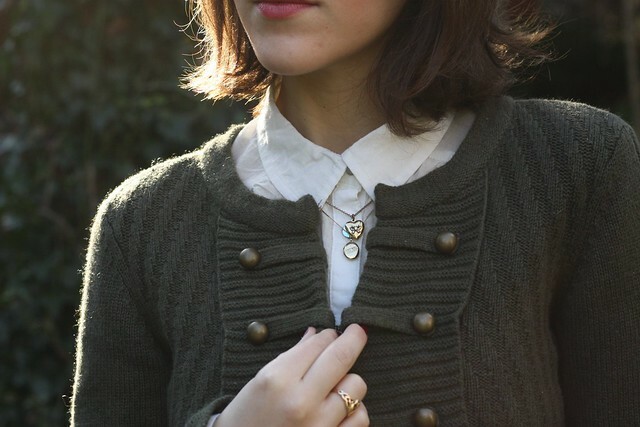 the details on the cardigan are really sweet too. my goodness, that little purse and those oxfords... so perfect. Yay! You look very pretty Kallie :) I have totally been one of those girls wearing jeans and flannel all last week. I need to invest in some of those shoes! The sweater has great design and military-look is becoming trendy right now. I'm with you when it comes to dressing up - even when it's not around the holidays! I can't help myself. I haven't participated in casual Fridays at my office even once...ah well. Anyway, I adore this outfit. I am sort of slowly trying to embrace more neutrals, and I think this might be the inspiration I needed. those shoes, those shoes, those shoes! such a cute cardi and love the buttoned up blouse ya big cutie!! love the title and the Robert Frost poem! the blouse and cardigan are so cute! I'm totally in love with your shoes and bag. So fantastic! This outfit is perfectly adorable. I love your basic white blouse with the cute military-detailed cardigan. Those shoes are pretty fantastic too. Cute. Love the purse! Love the style of the jacket. that close up is beyond gorgeous. you are beautiful and i love you blog for it's realness. thank you for not being another superficial blogger-girly!